Beware. An open splice beneath the plaster is a major fire hazard! It is not allowed to conceal a splice or a junction box behind drywall or inside the wall/ceiling. All electrical connections, terminations or wiring modifications must be contained in an approved and correctly covered electrical enclosures, device boxes, distribution and splitter boxes, panels, or cases, that are easily accessible. metal casing of a fluorescent light fixture with a cover plate, etc. Open enclosures and boxes with missing cover plates are not safe and a code violation. Fire is still the number one concern for all electrical systems. Most fires start because of arcing and sparking from poor contact, loose connections and the use of incorrect splicing methods. That is why the safety, fire, and building codes specify that all wire splice connections must be made and housed inside approved covered enclosures. 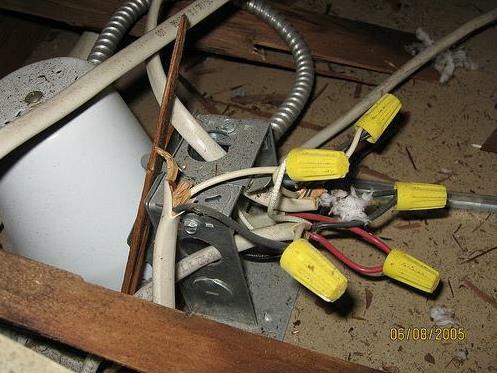 An open splice is an extremely serious fire hazard that can go undetected until it’s too late. Because a spark could jump out of the open splice or uncovered box, ignite an extremely dry and highly combustible dust inside the wall or ceiling and cause a major fire. The same spark or mini fire would start and die inside the closed casing. 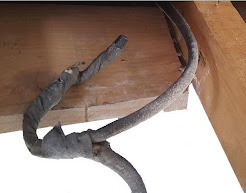 Electricians deal with burnt or melted wires inside boxes every week. This electrical contractor mostly does small and midsize residential jobs and commercial wiring. We do it every day, all the time, for many years and surely can help you. We are insured, affordable, licensed, fast, handy, capable, highly experienced, and reliable electricians. We can do most repairs, electrical, and renovation wiring jobs almost with our eyes closed. And we do it quickly, efficiently, correctly, strictly to code, and safely. We eliminate 80% of small problems and power failures within one hour (if nothing is damaged, broken, or burnt inside the wall, ceiling, or panel). Moreover, 40% of small defects are eliminated in just 20 minutes or even faster. 98% of customers are either pleased, satisfied, or outright happy with our work and its cost (the rest 2% of people are never happy with anything unless it is free). We love to get paid for the jobs well done. Every customer wants his problem fixed fast or her job done perfectly and quickly. Every electrician wants to get paid for his time, effort, and labor. But presence of the hidden behind drywall or plaster shoddy alterations and/or code violations from before would make even the shortest task much longer and more expensive. 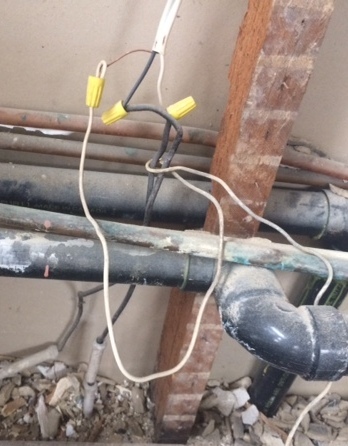 No electrician wants to work for free fixing defects, missing, rusty, deteriorated parts, or burnt wires that are hidden until he starts working. No electrician wants to be responsible for the lousy workmanship and errors of others. Or for not properly functioning parts of the system that he could not be aware of when giving an estimate. From our extensive experience we know that any job in a finished property could take more or much more time due to the obstacles that could only be uncovered after we start working. Your particular job could also take less time than you think. This is why we do not do free estimates for small repairs and short jobs. We offer prepaid estimates or hourly rates instead. A one hour site visit, investigation, consultation, and estimate requires a prepaid nonrefundable fee of $160 or more depending of the location and parking availability. The estimate will include this fee. You will NOT pay $160 extra if you hired us to do the job. Hourly method of payment is the fairest because customer will pay (and electrician will earn) less if the job was simple and straightforward, or more if there were complications and hurdles. This option is the fairest to both sides. It is the most flexible one at the same time, allowing any changes and adjustments as we go! Hourly rate approach allows us to talk you through each stage, explain, and discuss available choices, pros, cons, and costs. We are an expert, you are a decision-maker and budget-holder. You are the boss! You won't be in the dark as to what and why the electrician is doing and there won't be any unpleasant surprises. You will be in full control and finish up with a job well done as per your preferences. Moreover, you could stop the work at any moment, pay, and let the electrician go in the highly unlikely event you were not satisfied with his work or if it could go over your budget. Obviously, we will not ask you to pay in the next to impossible situation we made a mistake or error! And we will always fix it for free, no questions asked.